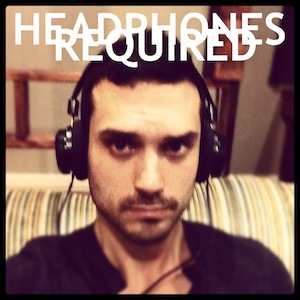 Andrew Foshee achieves acoustic indie pop worthy of some toe tappin’ and body swayin’ with Headphones Required. The Kansas City native and singer/songwriter begins Headphones Required with “Thunderstorm,” an upbeat, acoustic strummed melody met with Foshee’s soft and pleasantly twangy voice. Slowing things down a bit is second track, “Smile.” With a beautiful, slightly solemn melody and opening lyrics, “I mustn’t dwell on our differences, so let’s celebrate,” “Smile” repeats the theme of acceptance of heartbreak and differences causing two people to go their separate ways. Contrasting the tale of an ended love, “Love Is Everything” speaks to listening to each other and understanding that love is everything, alongside a steady acoustic melody with a bossa nova feel. Sticking to the subject of love is “Love Someone Today,” which happily speaks to not wanting the trouble of settling down, and finding love in the present. Following up with soulful “Pedestrian Blues,” Foshee slows things down and once again reflects on moving on after an ended relationship. Integrating the piano to accompany his acoustic guitar and vocals, Foshee develops his signature indie pop sound with the right amount of folk influence. This collection of seven feel-good tracks that would make any Simon and Garfunkel fan smile, is definitely worth a listen.